Also known as the “Quaker” style. 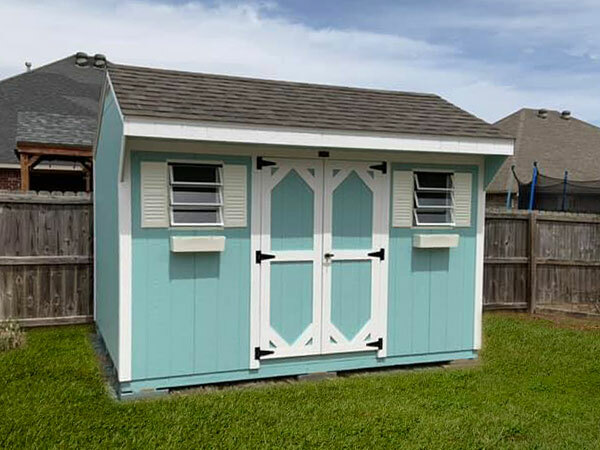 These storage sheds feature an offset a-frame roof with a large overhang on the front, giving it the look and feel of a quaint cottage. Ideal for lawn and garden storage. But also great for other specialized usages. The classic shed ideal for a variety of usages. Available in a variety of sizes and able to be customized to match your style and unique needs. These storage buildings are great for workshops, household storage, home offices, and more. Featuring the classic barn-style hip roof with high walls and space for a loft (standard feature). These storage sheds are incredibly flexible. Add a porch to create a lovely cabin, or a garage door for equipment storage. Our most economical storage barns. These wood sheds are practical and durable. ideal for you if you are needing more storage space or wanting to add a small workshop onto your property.